The Saudi-led coalition carrying out air strikes in Yemen has used US-supplied cluster bombs banned by much of the world, a rights group has said. Human Rights Watch (HRW) said it had evidence that the bombs were used at least twice against Houthi rebels. There were no reports of casualties. Cluster bombs spread small bombs over a wide area and can leave unexploded munitions buried in the ground. They are banned under a treaty signed by 116 countries, but not Saudi Arabia. The US and the other countries in Saudi Arabia's military coalition are not signatories of the 2008 treaty either. The US does however bar the sale of the weapons to countries that use them in civilian areas. HRW, which is based in the US, said one of the alleged cluster bomb strikes occurred in the al-Amar area of al-Safraa. The group published images it said were taken in the area and purport show the remnants of a CBU-105 Sensor Fuzed Weapon - a cluster bomb manufactured by Textron Systems Corporation in the US and supplied to Saudi Arabia and the United Arab Emirates in recent years. Saudi Arabia has previously denied using cluster bombs, HRW said. Shortly after the air strikes began, a military spokesman told the media: "We are not using cluster bombs at all." Saudi-led strikes against Yemen's Houthi rebel group, which seized the capital Sanaa and caused the country's president to flee, are ongoing. Their declared aim is to restore President Abdrabbuh Mansour Hadi to power. 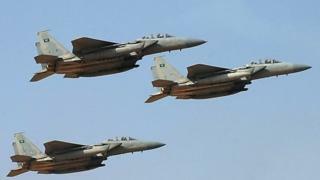 On Saturday, the Houthis called on the United Nations to urge Saudi Arabia to end its air campaign. More than 1,200 people have been killed and 300,000 have fled their homes in the past six weeks, according to the UN.